The scenic areas around the site of Hammaro have already been eroded by a suburban system of sprawled houses, a model that lacks public areas and that promotes a completely car-dependent lifestyle. In opposition to that, we propose a development where a variety of open spaces and typologies are present and pedestrian paths lead directly from the landscape to the centre of the new neighborhood. The proposal provides the setting of strong rules for the development of the built surface and the rationalization of the infrastructures, preventing unnecessary consumption of soil. Such rules are: a) delimitation of not constructible surfaces (courtyards); b) integration of existing buildings into the new scheme, adopting similar width/height for new buildings; c) continuity of the built environment around the voids; d) reduction of the motorways and increasing of alternative paths. 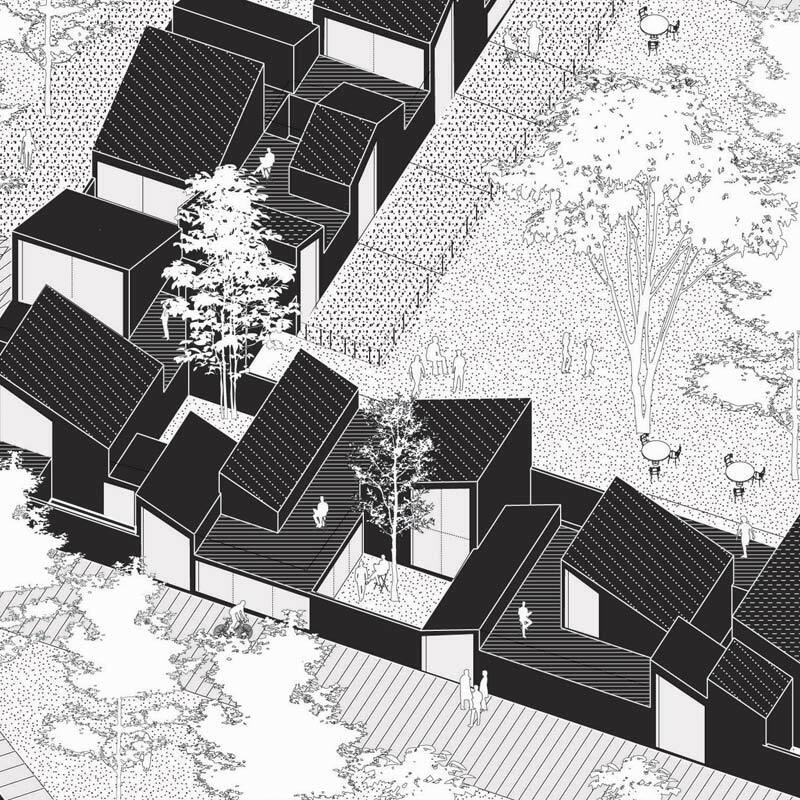 The project adopts a strategy of cohabitation between nature and community, setting up not just a fixed plan, but a model which provides its intrinsic rules for expansion. The evolution is possible on different stages. The unhierarchical system can grow following the needs of the population both for housing and for other activities. 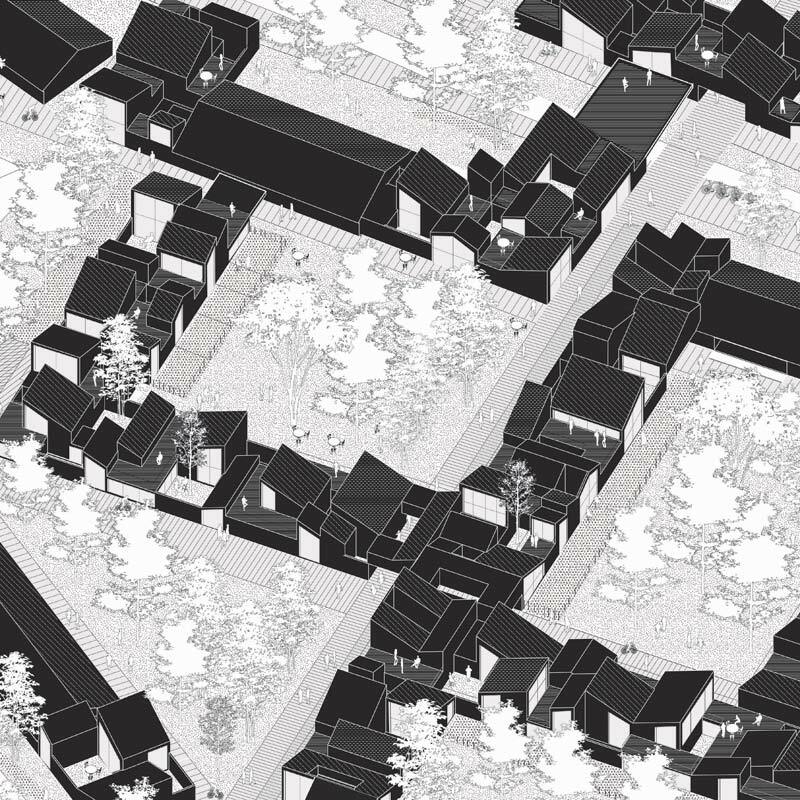 On an urban level the proposal shows a system of interconnected courtyards. The hierarchy streets/buildings is questioned and the voids are the main structuring element. These fixed voids contain the existing natural conditions which are integrated at every stage with the housing units and the built program. Only one road makes a loop in the site and is then connected to a diffused system of pathways leading to each single entrance of the buildings. Parking lots are limited to the areas that surround the main road. The arrangement of the new units around the courtyards follows that of the existing buildings, completing and connecting the actual sequence on the site. The future courtyards preserve the existing forest as it is and integrate the natural conditions, the trees and the soil into the developing neighborhood. In this way the recreational areas merge completely with the built units and contribute to the identity of the project. 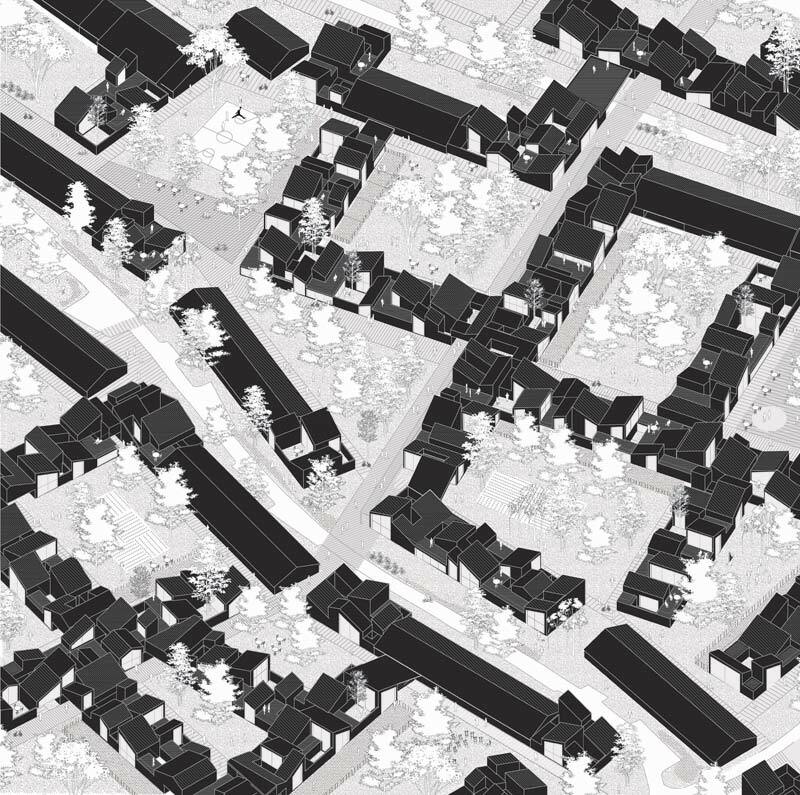 The morphology of the development and the relationship between the single houses, mediated by the large courtyards, aim at creating a sense of community in what is today a suburban context. Furthermore, the construction of a small-scale CHP powerplant, the reduction of energy needs through the adoption of passive-house systems and the adoption of heating recovery devices from the servers spaces to housing are integrated in a global strategy aiming at the transformation of an isolated settlement into an energy-self sufficient area. In an age of increasing social fragmentation, rethinking a neighborhood means to address the question of privacy as well as that of shared resources, spaces and time-shifts among citizens. The proposed model combines the compacity of built space, the optimisation of resources (spatial and environmental) with a sequence of open spaces that claim for informal occupations, leisure activities and, in general, shared spaces for the whole of the community. 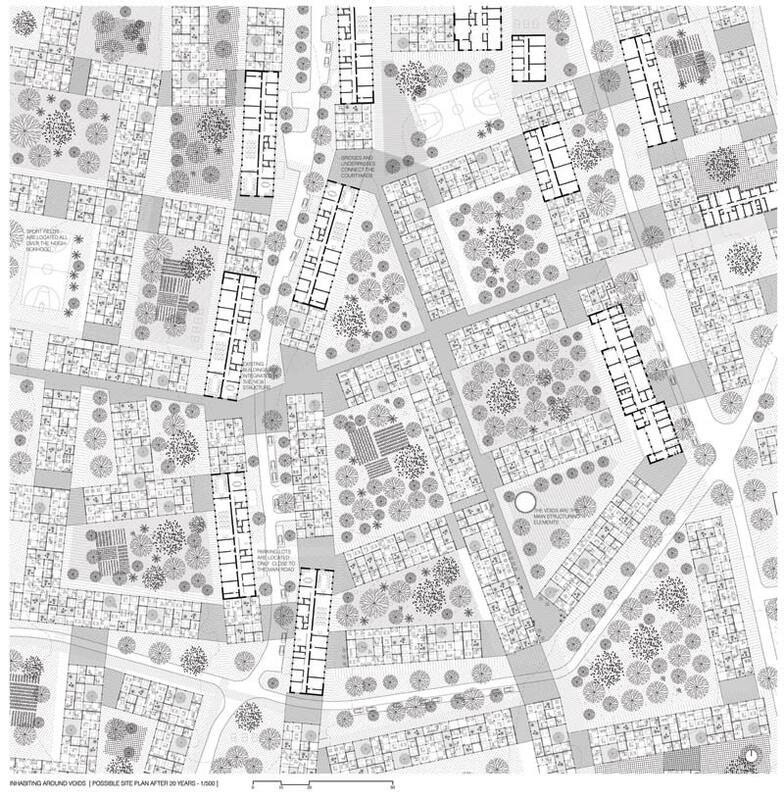 The commonplaces of suburbia are avoided in favour of a more compact scale that provides, at the same time, the humus for collective habitat. The buildings are not individual architectural pieces, but a continuous environment of interconnected neutral plans. Each building is made up by the assemblage of single rooms of 3m x 3m, whose absence leaves place to internal patios of multiples of that size. The result is a three dimensional sequence that can be organized differently through time. 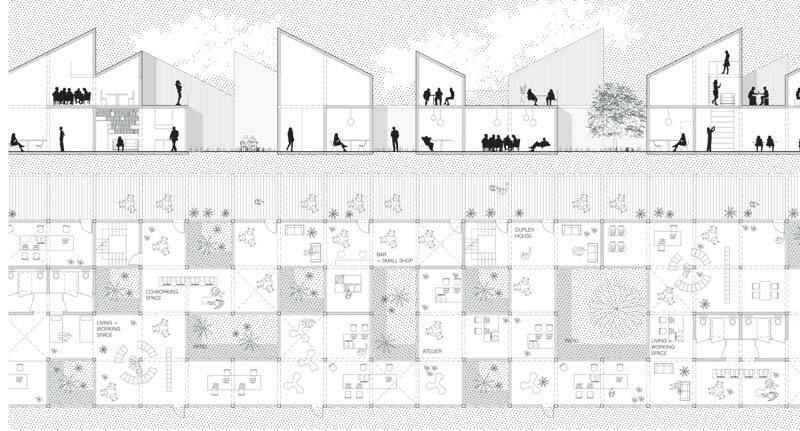 Single houses, but also workplaces such as offices, ateliers, workshops, recreational activities like bars and small restaurants can find their place on this grid and several functions can be joined together (i.e. an house with a home-office, a co-working space with rooms where to sleep and a common kitchen). The presence of a continuous plan and the repetition of the same element guarantees a constant adaptability through time: one or more rooms might be acquired by another unit, a house transformed in a office or divided in several ones, if needed. The apparent volumetric complexity of a possible courtyard ensemble is really the evolution of the assemblage of only three basic volumes, three standardized, prefabricated (and thus affordable) elements that can be re-assembled in countless ways. Since the program may vary depending on economic, social and demographic conditions over time, the neutrality of the buildings’ plan allows for different functions to be located, absorbed, or, if necessary, erased and converted, without having to call into question the original model.